A. Maintain your speed, keeping to the limit. B. Slow down and pay extra attention. C. Sound your horn to warn the other driver. Correct. Wider vehicles coming towards you may mean there is not much room to pass, therefore slow down. Bridges in rural areas are often narrower because wide bridges are more expensive to build and maintain. When there is very little traffic volume on a road, a two-lane bridge is sometimes an unnecessary luxury. If you are driving towards a one-lane bridge and you don't see a give way sign you must still give way to vehicles that are already on the bridge. Unlike a road, where you can often move onto the edge of the road, bridges don't have that feature - the edge is a hard edge. The bridge itself is likely to be narrower than the road itself so watch for the black and white signs that mark the bridge's edges on either side. As you can see in the photo below, the road is a two-lane road that becomes a single-lane bridge. 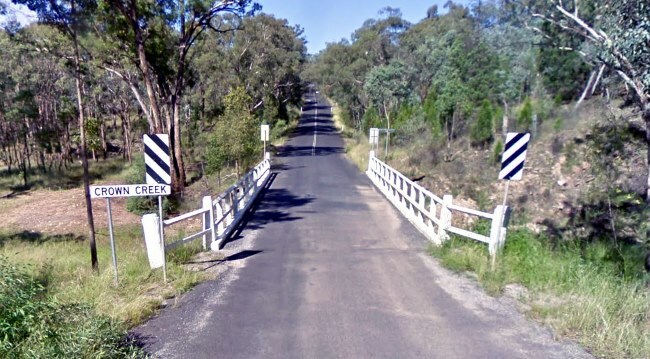 This particular bridge is on Glen Davis Rd near the Gardens of Stone National Park in NSW. It's not particularly well signposted on the approach. Take care in tourist areas because single-lane bridges can easily confuse drivers who are used to driving on the right, and when they exit the bridge they may inadvertently exit on the right-hand side of the road.